These reusable lids are manufactured using a plastic which falls into recycling category #7. 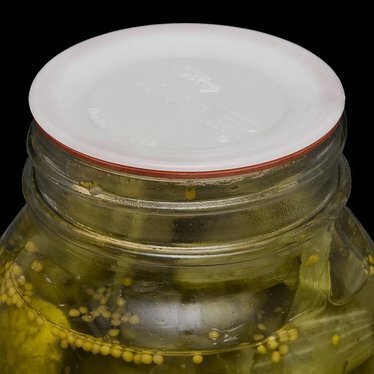 While some #7 plastics contain BPA and/or lead, we have reviewed several official documents from the manufacturer which strongly assure us that the plastic used in these lids DOES NOT contain BPA, lead or mercury or phthalates. Please read on for more information. From the manufacturer: Lids are made of FDA and USDA approved, food grade product known as Polyoxymethylene Copolymer (POM) or Acetal Copolymer. They DO NOT contain any Bisphenol A (BPA). This product is formulated using polyacetal base resin that is compliant for use in food contact applications according to (CFR), Title 21, 177.2470. Any additives that may be present comply with appropriate, specific FDA Regulations. Love the idea they can be used over and over. Wonderful for using with acidic products that react to the metal bands...no more was paper!